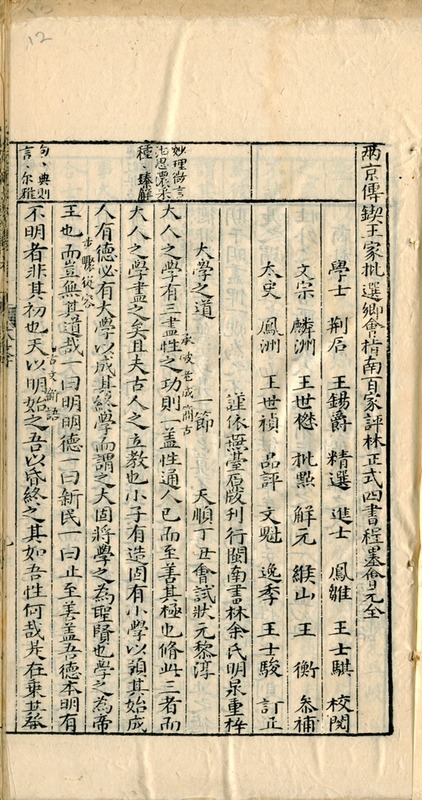 Chinese books in Europe in the 17th century was one of my first attempts to take stock of our holdings and bring them to the attention of scholars. 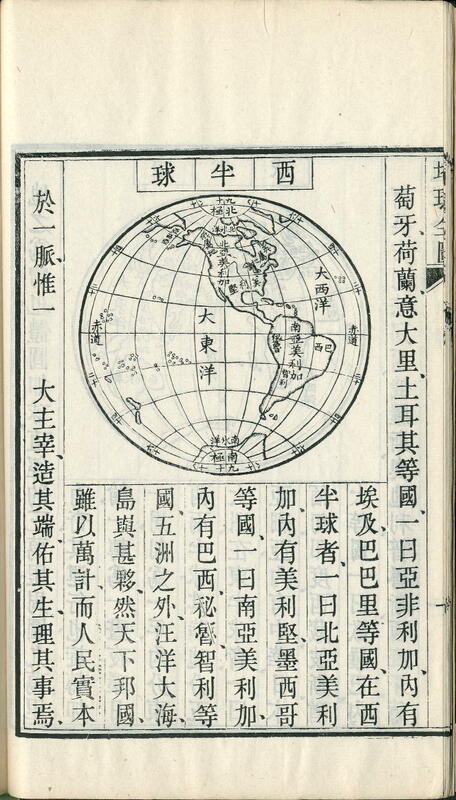 It was there that Robert Batchelor first noticed my rather primitive description of what we now know as the Selden map of China, and this is what led him to examine the map and to discover its unique importance. I have still not catalogued all the items in this list, because they are mostly fragmentary, and very difficult both to identify and to describe in a satisfactory way. Our five fascicles of “model answers” are a case in point. I used one of them in the exhibition recorded in my previous blog entry without really knowing exactly what it was, except on the most superficial level. I never imagined that to identify and describe them would take me a fortnight’s work, and I’m still not entirely satisfied with the result. Colleagues in the Faculty have occasionally suggested that it might be a good exercise for research students to take things from this corpus and work on them, perhaps even to the point of basing a dissertation on them. 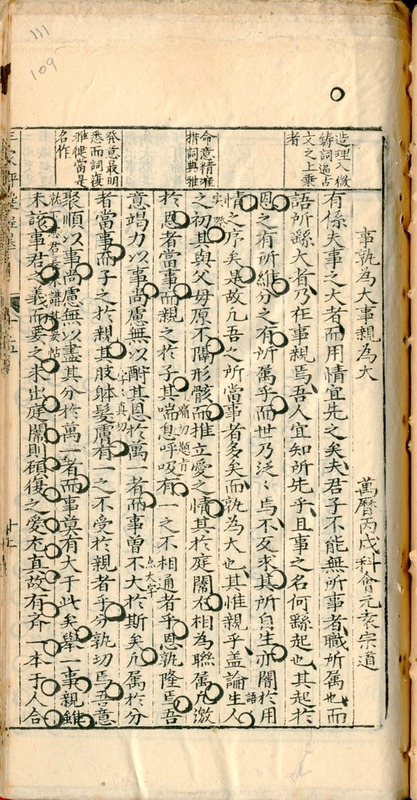 Glen Dudbridge did no less when he used a unique surving edition of Xiyouji (Sinica 35) for his doctoral dissertation in 1967. We need not spend too much time on their provenance. Like Sinica 2, they are among the Library’s earliest accessions, acquired by Bodley himself using money given by benefactors, their names being inscribed on the fascicles whose purchase they financed: Edward Michelborn (Sinica 20 and Sinica 22) and John Pory (Sinica 21). 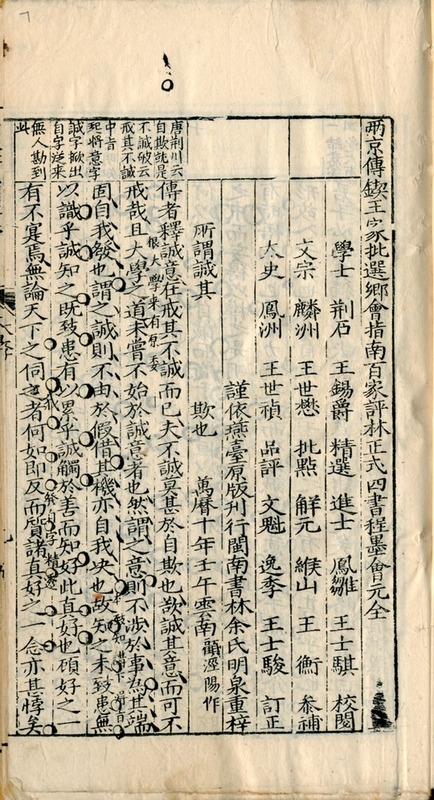 All five fascicles are paper bound, the covers of Sinica 20 and Sinica 21 being of very soft, coarse paper fairly light in colour, while those of Sinica 22 are of a smoother, darker paper. In the 1970s, in an act of rank antiquarianism the then Keeper of Oriental Books, Norman Sainsbury, had them bound in imitation 17th-century limp vellum bindings. Unfortunately, the vellum is very far from limp, and is gradually wrecking the contents it was supposed to protect. I distinguish three separate copies among these five fascicles, because that is the only way to make sense of their contents. 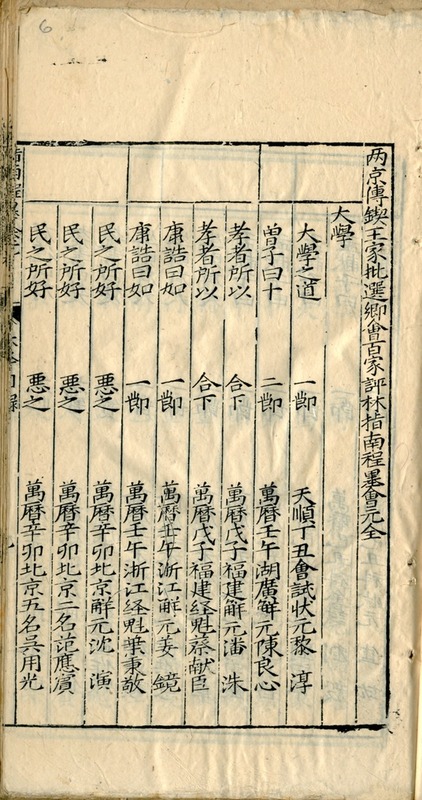 In the three fascicles of Sinica 21 they are distributed as follows: 1, title-page (feng mian 封面), da xue 大學, zhong yong 中庸; 2, shang lun 上論, xia lun 下論; 3, shang meng 上孟, xia meng 下孟, colophon (pai zi 牌子). And in the case of Sinica 21 and Sinica 22, these sections are all in a single fascicle, and the leaves are much fewer in number. The first question is what editions these leaves are taken from. I can distiguish, but in most cases not identify, at least five, and there may well turn out to be more. This set of pages is rather more difficult to deal with, as it is not clear whether one, two, or even more editions are represented. We have the first leaves from the da xue 大學, zhong yong 中庸, xia lun 下論, and shang meng 上孟 sections, but no corresponding tables of contents. 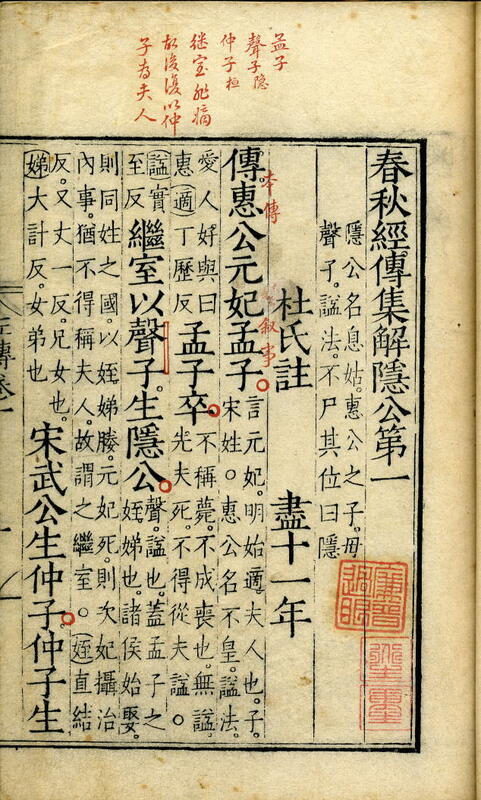 The da xue and zhong yong sections bear the title 「京傳靜觀室精選諸名家批評四書指南正式墨卷」, whereas the xia lun and shang meng sections bear the title 「京傳四翰林精選諸名家批評四書指南正式墨卷」. This does not necessarily mean that two different editions are present, as it is quite common for the chapter titles in editions of this sort to vary in this way. Only the presence in the copy of different versions of the same leaves would confirm that more than one edition were involved. This would involve a detailed study of all the “inner” leaves of the assemblage, and to do the job properly, sooner or later someone must list them, arrange them in order, and compare them. But as there are over 900, this is a task which I’m going to leave to the dissertation-writer. Aside from the title, this and the editions below differ from (1) and (2) in their block format (the frame is not divided) and the thinner, yellower paper on which they are printed. These two leaves are even more problematic. They are entitled 「新刻兩京十三省元魁程墨」 and 「新刊乙未科會試五魁墨卷」. Both are the first leaves of the xia lun 下論 section. Their format is different from that of any other leaf in the assemblage in that it has two yu wei 魚尾 (fishtails) in the central column of the block. Although it is possible that two different editions are present, it is equally possible that the leaves represent different sections of an unusually complex compilation. 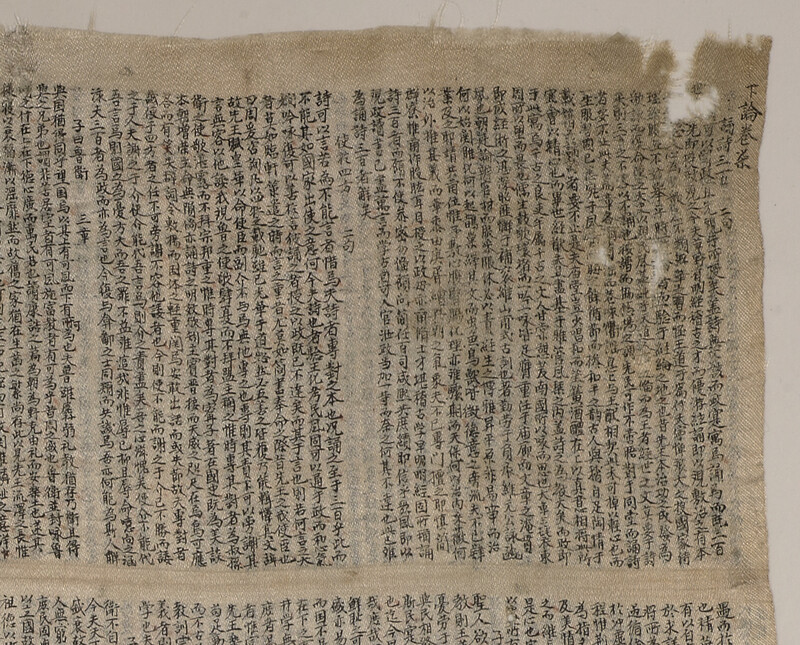 This is the only leaf I have discovered in the assemblage that has the title in a so-called “ear” (shu er 書耳) projecting from the side of the text frame: 「新刊壬辰會試五魁墨卷全卷」. The block format is identical with that of editions (1) and (2), and the paper is also the same, but if it is from one of those editions, it is odd that of the hundreds of pages present, it should be the only one to have an “ear”. Also, the title is very different, having more in common with edition 4. I’m therefore inclined to regard it as perhaps a fifth edition in the assemblage. 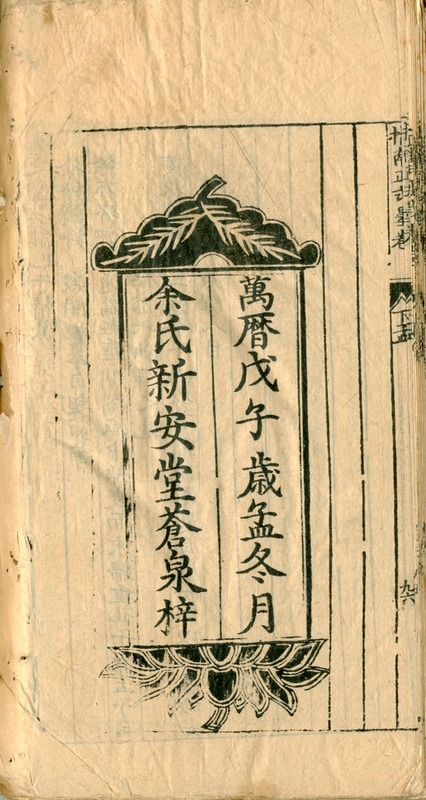 The title-page (or shall we say a fengmian 封面) at the beginning of Sinica 20/1 is printed on the thinner bamboo paper, and so may be of a piece with editions (3) and (4). The text of the title-page is not very helpful. 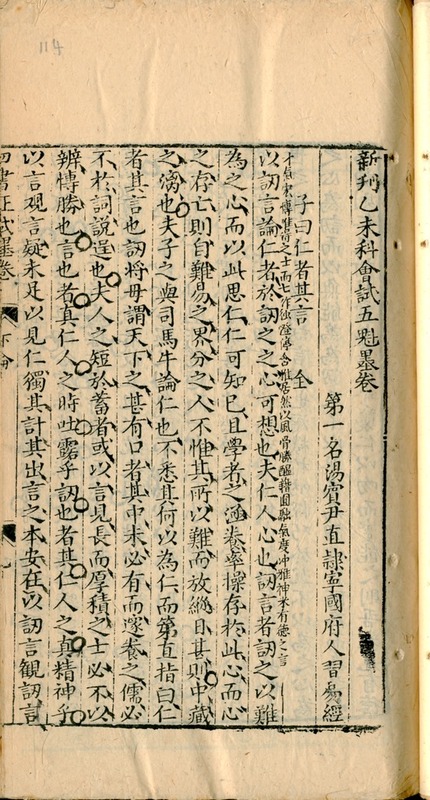 The block format of these two colophons, obviously both from the end of the xia meng 下孟 sections of their respective editions, suggests that they are from editions (3) or (4) above, but it is impossible to say which. Here again, a detailed analysis and comparison of the “inner” leaves might help, but without the tables of contents of these editions it is doubtful if any definite conclusion could be drawn. They do however give us some very useful information: the date 1588, and the names of Yu family members. So we know that at least three members of that prolific printing dynasty turned their hand to printing model answers: Yu Mingquan 余明泉 (editions 1 and 2), Yu Cangquan 余蒼泉 , and Yu Xiufeng 余秀峰. This leaf comes right at the front of the first fascicle in the assemblage (Sinica 20/1), and presents a horrible problem as not only can it not be related to any of the contents, but in form it seems to combine elements of two different families of editions: the block format and whiter paper of editions (1) and (2), but the title of edition (3). 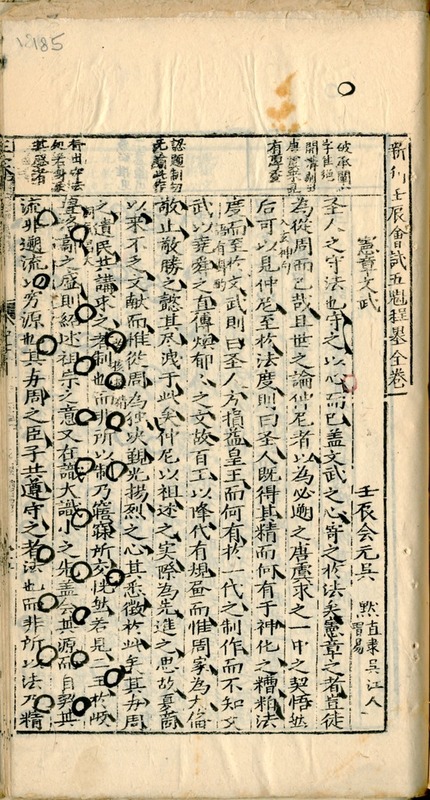 The various portions of the table of contents that survive of the various editions show that they were all arranged in the same way. Each of the essays examines a quotation from one of the texts, and the essays are presented in the order in which these passages appear in the text. 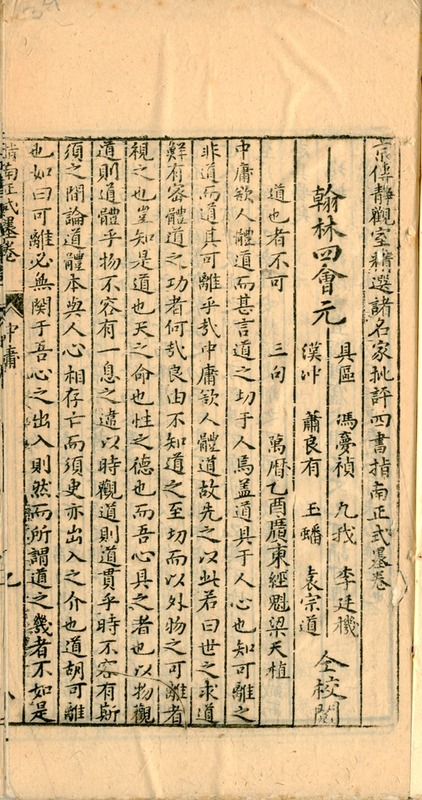 Thus the first essay in the da xue section of Sinica 21 is on da xue zhi dao 大學之道, the opening words of the text, and the last is on the words meng xian zi yue 孟獻子曰, which comes at the end of the traditional commentary attributed to Confucius. Leaves from the various editions have been carefully intermingled to conform with this arrangement, so that inevitably there is a discrepancy between the table of contents, which obviously only applies to one edition, and what is present, which also comes from other editions which may have extra content. This, combined with manuscript punctuation and highlighting which occurs here and there throughout the copies, shows that they were no mere ornaments on the shelves of their owners, but have actually been used for serious study. I have tried in vain to find copies of these editions in other catalogues, both printed and online. Is it possible that the leaves preserved in Sinica 20-22 are unique survivals? I also assumed that published sets of “model answers” would be very common, but I’m finding the opposite to be true. Am I looking in the wrong place, I wonder? As promised in my last blog entry, I am now presenting the contents of an exhibition in the Proscholium of the Old Library. This was designed for the public, most of whom know nothing about Chinese books or the traditional Chinese examination system. My blog entry is therefore for the record, rather than to inform my readers, who will know all about these things, and more. The Proscholium is the main entrance to the Old Library, and against one of its walls there is a large exhibition case in which temporary displays are mounted. What follows is an account of what this case contained between 22 February and 6 April 2014. In traditional China the most respectable careers were in government service. For most men the route to this was through the triennial examinations that were held at provincial and national levels. Success at the provincial level qualified them for the lower ranking posts, and also for candidature in the national examination which was held in the capital. And success here qualified them for the highest positions in the land, with the prospect of lasting fame both for them and their families. Education was centred on the canonical texts of Confucianism, and in particular, the Four Books and Five Classics. These were essential reading for all who aspired to a post in government, and for most of its history, were the “set books” for the questions in the examination system. Examinations were held in large complexes such as the one illustrated below. 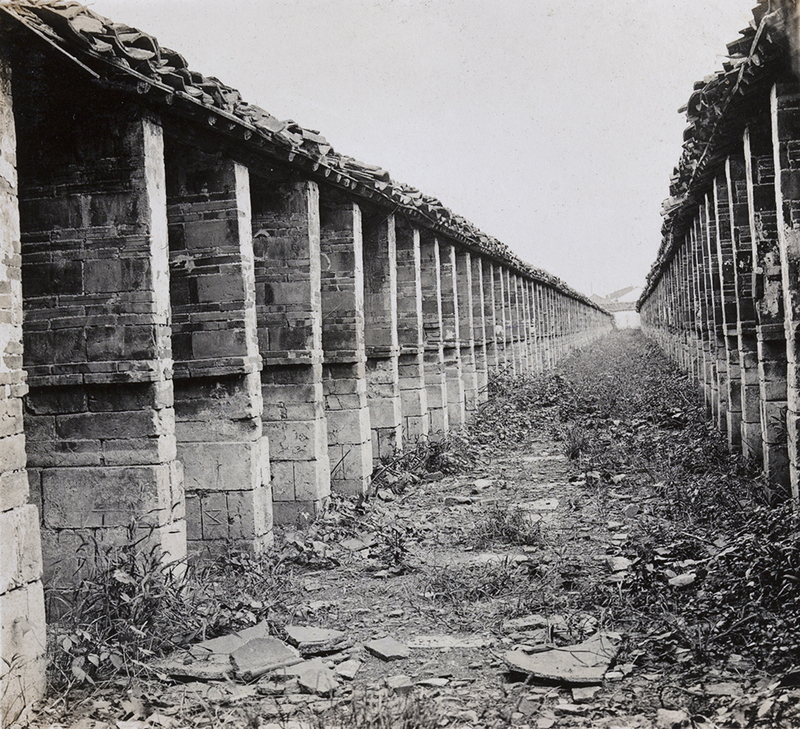 These photographs are of the provincial examination cells in Nanking, and were taken in 1913, ten years after the system had been abolished, so they are already falling into ruin. 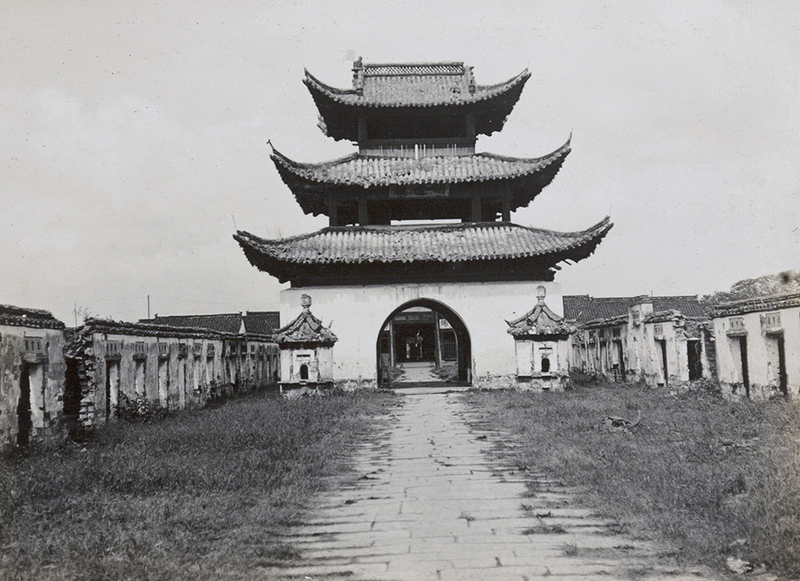 This was the largest examination complex in imperial China, with over 20,000 cells in use by the late Qing dynasty (1644-1912). 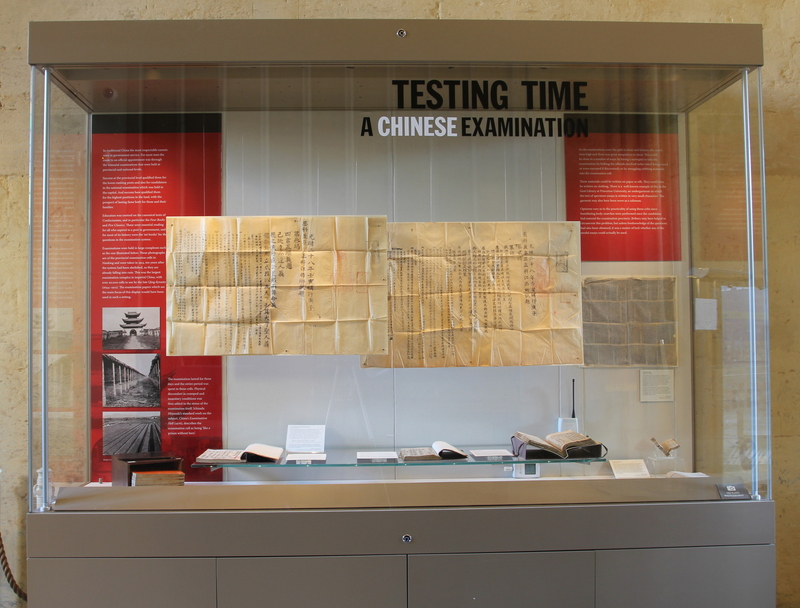 The two examination papers (of a set of three) which are the main focus of this display would have been used in such a setting. The examination lasted for three days, and the entire period, was spent in these cells. Physical discomfort in cramped and insanitary conditions was thus added to the stress of the examination itself. Ichisada Miyazaki’s standard work on the subject, China’s examination hell (1976), describes the examination cell as being “like a prison without bars”. The seals on the right side of each paper were applied at various stages of the examination process to certify that the paper had been produced and distributed according to the correct procedures. The Spring and autumn annals was one of the Five Classics, and a candidate from a rich family would have editions like this to study from. It is one of the finest in the Bodleian Library’s Chinese collections. 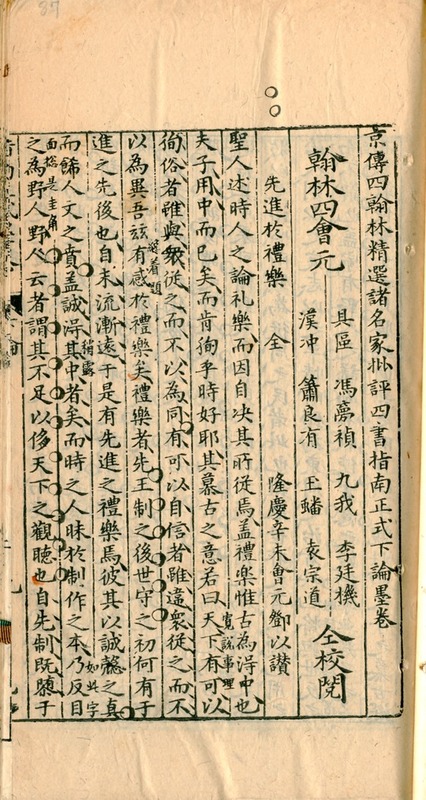 It was produced in the mid-Ming dynasty (c.1500), and is a close copy of the edition of the classics originally prepared two or three centuries earlier in the Yuan dynasty for the family academy of a certain “Mr Yue of Xiangtai” 相臺岳氏. Books like this were very expensive, and of very limited circulation. 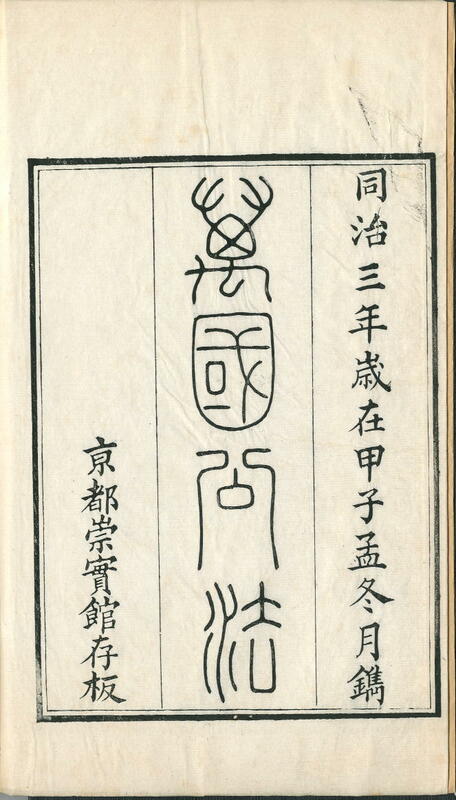 This is an example of a traditional Chinese block-printed book. The leaves are printed on one side and then folded to form a page with the folded edge at the front, and the covers are then stitched on with thread. So we call such bindings either “doubled-leaf bindings” or “thread bindings”. 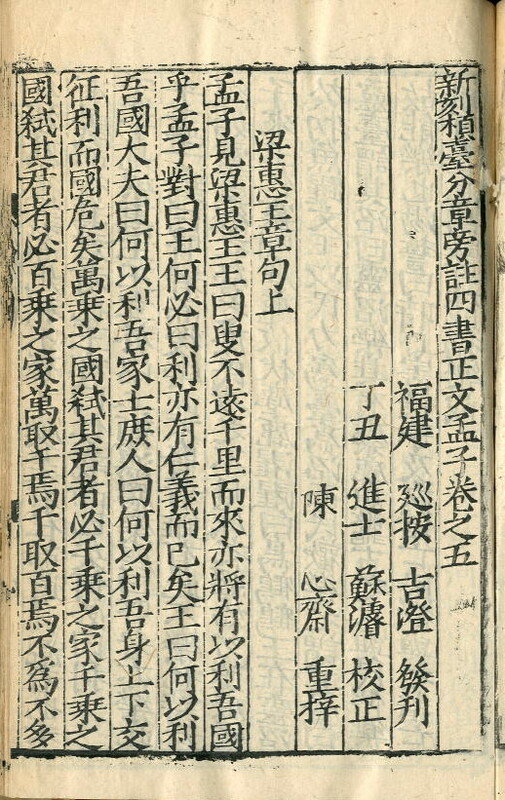 Almost all pre-modern Chinese books were bound in this way. 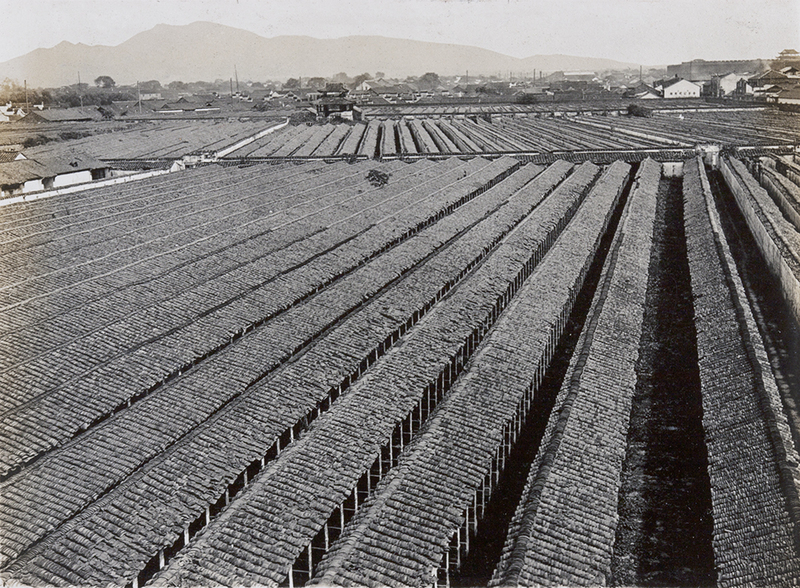 The fascicles are laid flat, and in this example they are stored in camphorwood boxes to deter insects. 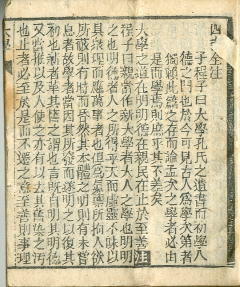 By contrast, this fagmentary copy of an edition of the Four Books was produced in the late sixteenth century in Jianyang, Fujian province, which was the centre of commercial book production during the second half of the Ming dynasty. It is a cheap edition, and although it was probably circulated widely at the time, this copy is a unique survival. It was brought to Europe by merchants of the Dutch East India Company as a curiosity, sold at auction in Amsterdam, and bought by agents of Sir Thomas Bodley for his new library. Here, it was given its limp vellum binding. Nobody could read Chinese at that time, or could even tell which way up the book was supposed to be, so that Bodley’s inscription is upside down. 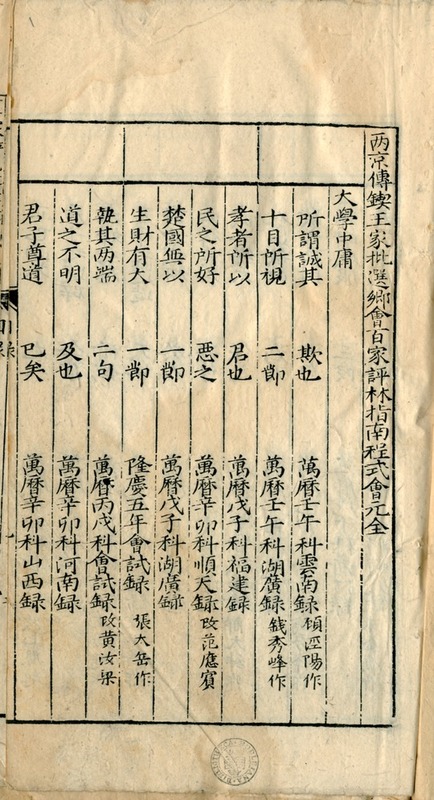 The Dutch East India Company merchants bought books like this from overseas Chinese communities in Southeast Asia, and they had no idea what they were buying. This is a very inferior edition, and could only have been used at the lowest level of the learning and testing process, but it shows how pervasive was the desire to learn the right things and to progress accordingly. This attitude to learning and examinations is nowhere more apparent than in China and other East Asian countries at the present time. 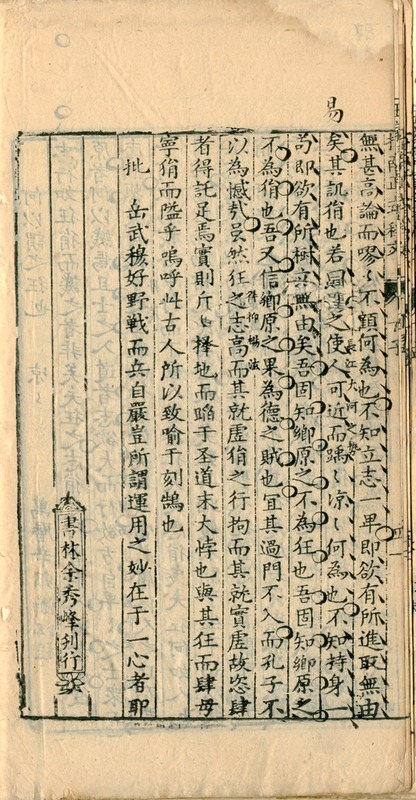 Further evidence of how popular learning was oriented towards the examination system is this book of model answers, which is of the same provenance as Sinica 2. As in modern examinations, the questions were often based on the same passages of text, and collections of answers by successful candidates were compiled and published for study and memorising. This was not as difficult as it sounds, as at that time the essays were limited to 500 characters. 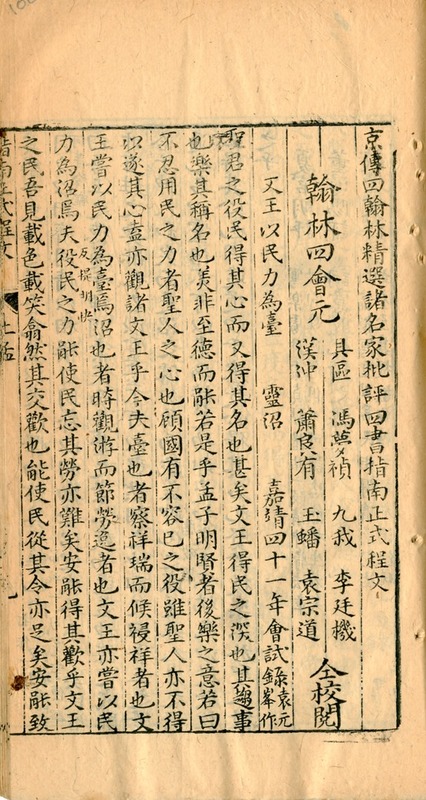 The book is open at an essay on a passage from Mencius (one of the Four Books) extolling the virtue of filial piety, the glue which held Chinese society together. It has 431 characters, well within the permitted length. 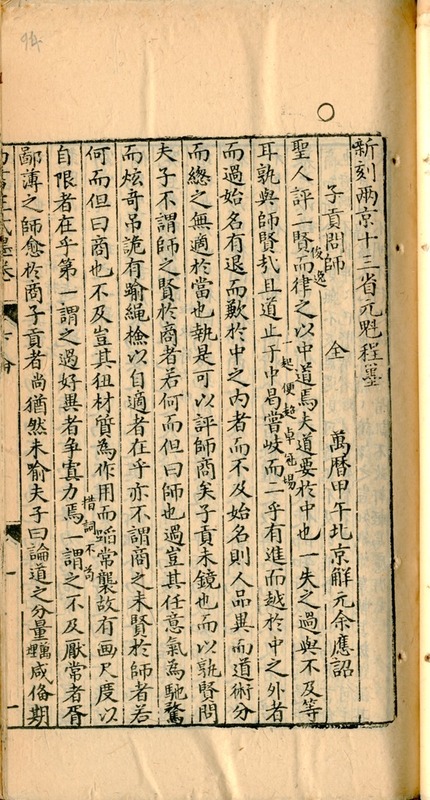 We are told that it was written by Yuan Zongdao 袁宗道, who came first in the metropolitan examination of 1586 (Yuan was a famous scholar who for a time was tutor to the Emperor’s eldest son and heir apparent). The black manuscript circles are the equivalent of our underlining, and show that the text has been well studied. 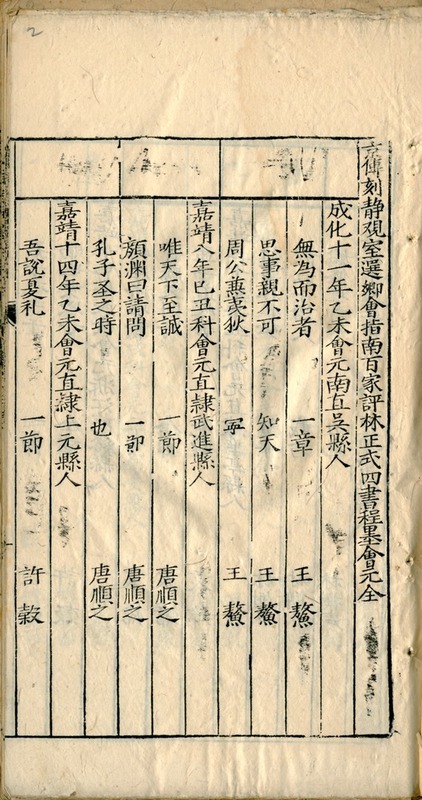 The second of the two examination papers gives evidence of what had become required reading during the reforms at the very end of the Qing dynasty. It refers specifically to Henry Wheaton’s Elements of international law. This had been translated by the American Protestant missionary W.A.P. 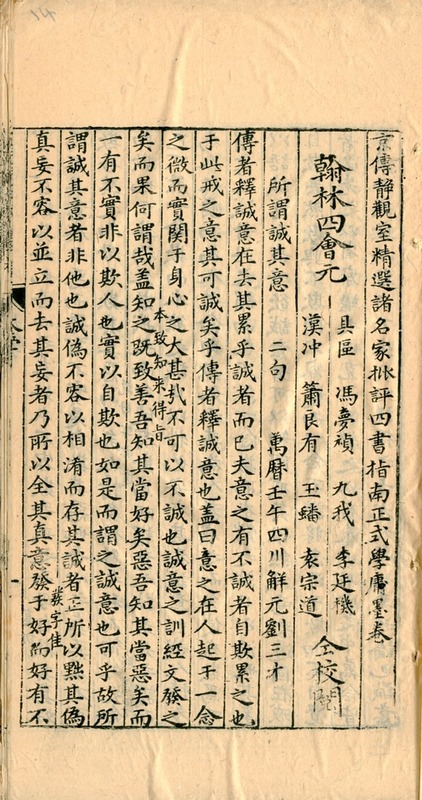 Martin and printed and published by the Chinese government in 1864. Wheaton’s work was influential throughout the world, and especially in East Asia, where it introduced the concept of international law for the first time. 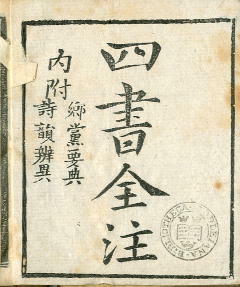 We show the first Chinese edition of 1865, which is block-printed. The four fascicles are contained in a wrap-around container, which would then lie flat on the shelf. This was the normal way in which Chinese books were stored. 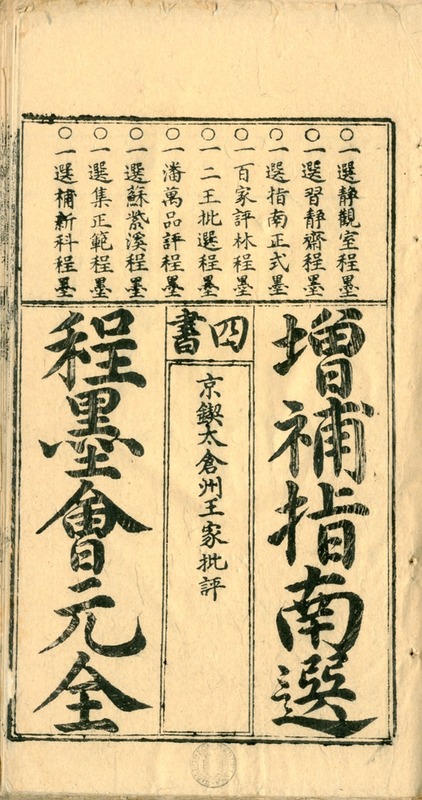 However, candidates for the Nanchang examination of 1902 would probably have used one of the late nineteenth-century editions printed by western typography, which by that time was rapidly replacing the block-print tradition. As the examinations were the path to fame and fortune, the stakes were high, and there was great temptation to cheat. This could be done in a number of ways: by hiring a surrogate to take the examination, by bribing the officials involved (who risked being caned or even executed if discovered), or by smuggling cribbing materials into the examination cell. These materials could be written on paper or silk. They could even be written on clothing. There is a well-known example of this in the Gest Library at Princeton University, an undergarment on which the text of specimen essays is written in very small characters. The garment may also have been worn as a talisman. Opinions vary as to the practicality of using these cribbing materials, as humiliating body-searches were performed when the candidates had entered the examination precincts. Bribery may have helped to circumvent this problem, but unless foreknowledge of the questions had also been obtained, it was a matter of luck as to whether any of the model essays could actually be used. A crib sheet in the form of a napkin, containing about two dozen model essays. Each essay is no more than 700 characters in length, which was the maximum permitted by imperial decree in 1778, an increase over the earlier limit of 500. These essays were written in the so-called “eight-legged” form, a complex structure which became compulsory in the fifteenth century, but which was abolished in the reforms of 1901. This crib sheet is finely written in ink on silk, and would have been very expensive to produce. Its use for cribbing would have been quite feasible, as it would have been very easy to conceal. However, some scholars think that if a candidate knew enough to be able to use such materials, he wouldn’t really need to. A tiny printed edition of the Four Books. This is the smallest block-printed Chinese book in the Library’s collections. Such editions were known as “sleeve editions” as they were small enough to be hidden in the sleeve of a garment. But it is doubtful whether they would have escaped all but the most perfunctory of searches, and it is also doubtful whether a candidate in the provincial or metropolitan examinations would have needed a copy of these elementary texts. Most likely, editions like this would have been used in local examinations.